An improved system for the recovery of condensate and injection of feed water under normal conditions of temperature and corrosion. For use with scotch-marine and fire tube boilers at operating pressures up to 150 PSI. For locations requiring automatic unattended operation. The improved design includes field demountable receiver tank with bottom legs. The receiver tanks are uniform design with flanged heads and high grade welds. All special wiring ordered on duplex units are installed in a single panel box. The unit consists essentially of a receiver tank to collect the returns, one or more pump sets controlled by a float switch mounted on the boiler water column, and a float valve in the receiver to introduce make-up water when needed to replace system losses. In standard industrial installations the condensing equipment on the steam lines dumps water back through the traps at temperatures of 180˚ - 190˚ F. In normal steam heating systems the temperature is even lower at about 160˚F. Chemical treatment of feedwater is introduced through by-pass feeders in the line between the pump and boiler or by means of proportioning pumps directly to the boilers so that feedwater chemicals do not pass through the pump. 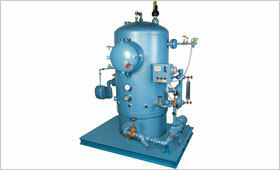 Feedwater systems are selected for the type, size, and operating pressure of the boiler. All Roth 212˚F feedwater systems are equipped with Roth one foot NPSH pumps guaranteed to deliver full rated capacity of boiling water to the boiler. Roth one foot NPSH pumps were originally developed to pump 230˚F deaerated water from the deaerator to the boiler. This original design has now been improved to include high capacity models fully functional at one foot NPSH. 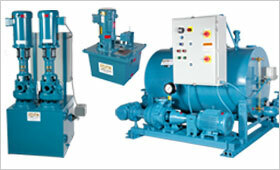 Pumps utilized for these systems are equipped with seals suitable for 212˚F water. 100 to 800 boiler horsepower. 20 to 200 PSIG operating pressure. Required NPSH - 1 ft.
Full rated capacity of boiling feedwater in installations developing occasional flash returns. Roth patented pump guaranteed to deliver full rated capacity of boiling water at one foot NPSH. Full ball bearing design. No internal water lubricated bearings. Low silhouette assembly requires minimum head room. Patented drain-vent protects against back siphonage and steaming.